If your pet has ever had a cut paw pad or other paw injury, you know how hard it is to keep him or her from chewing on it. The Snuggy Boots Suspender System helps heal paw injuries. Imagine your pet’s paw covered in a bandage. Your dog’s inclination is to lick, chew or eat the bandages. 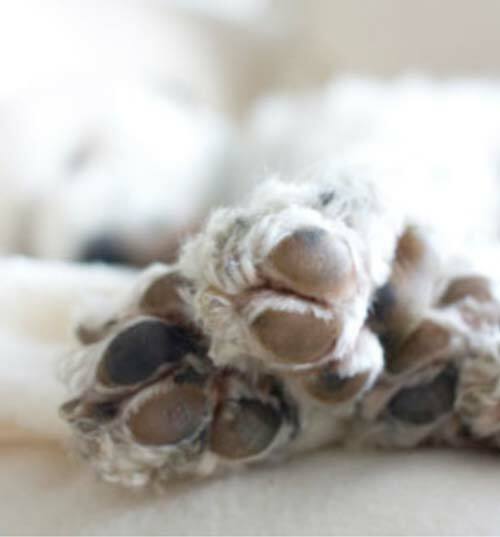 Not only is that not going to help your pet’s paw heal, it could contaminate the wound. Your dog can wear the cone to prevent the bandage destruction or dog boots connected to suspenders to keep them in place. We think the latter is more comfortable and a little more dignified. Here’s what one of our customers said about the Snuggy Boots System. My Golden Retriever Gus cut the bottom of his paw on some sort of sharp object in the woods while we were hiking. It bled something awful. …. The vet bandaged it up but the bandage got dirty, came loose, and the paw became infected. When the vet bandaged the foot again he provided me with a set of boots and a set of Snuggy Boots dog shoe suspenders to keep the boots on. I think the boots helped hold the cut paw together, but it kept the bandage clean and Gus could not chew on his bandage. I don’t know how his paw would have healed if it hadn’t been for the shoe. We now use the shoes and Snuggy Boots when we go hiking in areas where there could be hidden hazards. Dog’s paws and paw pads are tough but they’re not indestructible. They’re exposed to sharp objects on the ground like nails, rocks and glass. Ice and salt in the winter can irritate their paws and you never know when someone will develop a cracked toenail or torn paw pad. 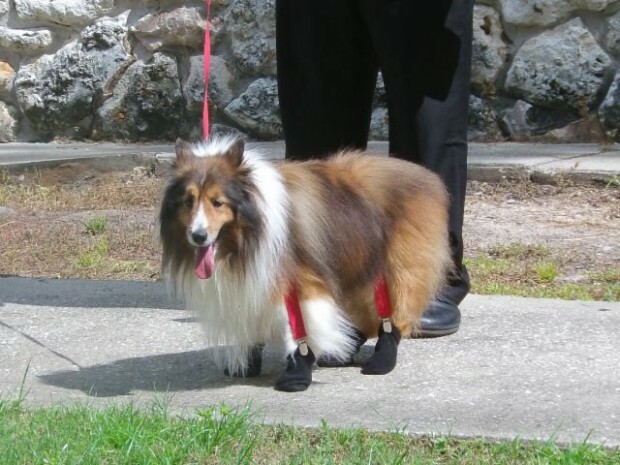 The Snuggy Boots Suspender System helps heal paw injuries by keeping your pet’s paws covered. It works with all types of dog boots or you can order both dog boots and suspenders together.